Pregnancy does weird things to people. While I had quite an uneventful pregnancy the first time round, almost devoid of nausea attacks, my second pregnancy has so far proven to be a force to be reckoned with. I now not only have morning sickness, I actually have all-day sickness. My nose has transformed into the bionic nose, with the ability to smell the faintest of smells, and what’s worse, almost all smells are revolting to me now. I also discovered that I cannot stand the smell of garlic, although I loved it pre-preggers. So I can’t cook with garlic now, because the smell of garlic on my fingers after cooking will make me pukey. Strangely enough though, while I shun the very sight and thought of garlic, ginger has the opposite effect on me. And it wasn’t too long before I realized that one of the foods I craved for now is ginger and spring onion chicken rice, more widely known as “kngeow charng kei pui” in Hokkien or “keong choong kai fun” in Cantonese. Truth be known, I can eat this every day and not be tired of it. So when I discovered this Hochiak recipe in Pablo’s Delicious Asian Food, I couldn’t wait to try it out. Everyone knows that homecooked food tastes so much better than food bought outside. Okay la, plus the fact that there was a USD100 up for grabs that spurred my enthusiasm even further. Heh. Being the stubborn and determined person I am, I certainly wanted to try perfecting it. So two days later, while my two princes were off to dreamland, I attempted to dish out a respectable looking plate of Ginger Sauce Chicken. Figuring the blackness could be due to the fact that I had reused some of the oil used to fry the chicken to make the sauce, I decided to use fresh oil for the sauce this time round. Instead of using ginger juice to marinade the chicken, I sliced up a LOT of ginger real fine, and mixed it with the chicken fillet, together with a dash of soya sauce and pepper. And oh, I omitted the garlic in the recipe because of very obvious reasons 😛 . I had it for my tea-time and supper that day. And hubby said it was definitely better than the first attempt. Hee. By the way, wanna put yourself in the running to win USD100? Go check out Delicious Asian Food now, and cook yourself up a storm! The Giddy Tigress says: Sorry, gotta wait for the next round! Phooiyo! What a difference between the 1st and the 2nd attempt! Well done! The Giddy Tigress says: Thanks! 🙂 Great recipe! Looks like those from the taichow stall! I also had a worse case of “all-day-sickness” during my 2nd pregnancy. But I think with a toddler in tow, we don’t have the luxury of labouring over it. The Giddy Tigress says: You’re right about that. This time round, I find I don’t have the luxury to REST as much. Btw, didn’t know you are pregnant!! Congratulations!! The Giddy Tigress says: Thank you! The Giddy Tigress says: Thanks Wen! 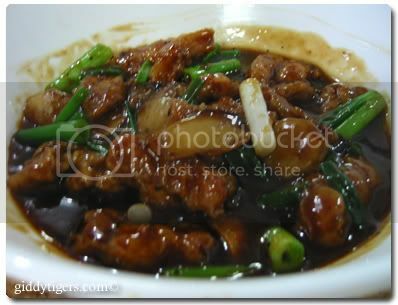 and, tonight i will cook this “Ginger Sauce Chicken” too…hehe..just so tempted to cook it after saw your delicious Ginger Sauce Chicken in my reader! The Giddy Tigress says: So how did yours turn out? The Giddy Tigress says: Oh yes it was! eh?? ?u r pregnant with ur 2nd bb??? ohh i’ve missed so much!! The Giddy Tigress says: Yep I am! Thanks! Definitely 2nd time lucky! Good job! The Giddy Tigress says: Thanks PB! The Giddy Tigress says: hehe…we’ll see! The Giddy Tigress says: Oooh, so I have takers for both of my attempts! Cool! The Giddy Tigress says: Your cheese biscuits look marvellous, Jin Hooi! I’ve got an award for you. The Giddy Tigress says: Thanks for the award! The Giddy Tigress says: We are in the same boat then! The Giddy Tigress says: Thanks! wah congratz on ur pregnancy! will it be a she or a he? 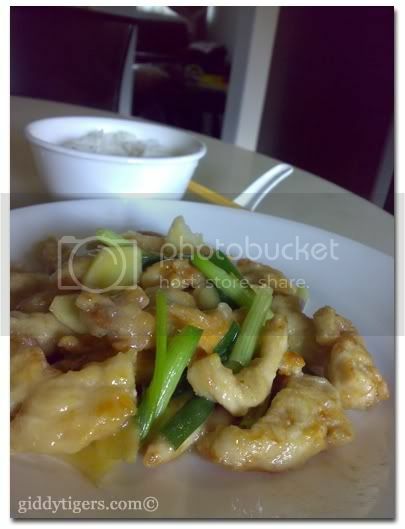 nice dish… looks like butter chicken too! The Giddy Tigress says: Oh it’s too soon to tell the baby’s gender yet. Butter chicken eh? Now that’s a thought! The Giddy Tigress says: Awww…that comment just made me melt. Hugs to you, my dear! Pingback: Giddy Tigers » Entry #4 calling for votes! Congrats on your forthcoming bundle of joy, dearie. I love both the tau ewe one and the ginger one.haha. Both you and cooking momsters get my support !! Am voting for both of you.hee hee.. The Giddy Tigress says: Thanks for your support! The Giddy Tigress says: Thanks Angeleyes! And this is my favourite dish! The Giddy Tigress says: Oooh, that’s cool! We have something in common then! If you’re craving ginger, i highly recommend the culpepper ginger and honey drink – simply add to hot water. It’s delicious and usually I really dislike ginger drinks. The Giddy Tigress says: Haha thanks! Looking forward to that….. I’ve never tried that drink you recommended – where can I find it? I have never liked stuff like ginger tea though…..you sure this drink tastes nothing like it?